u-blox has announced that its NINA-B3 modules are now qualified for all Bluetooth 5 features, including long range applications. With NINA-B3's comprehensive Bluetooth 5 support, Bluetooth long range qualification and worldwide certifications, u-blox customers can open up new markets with innovative applications, further shorten time to market and make more efficient use of their engineering teams. 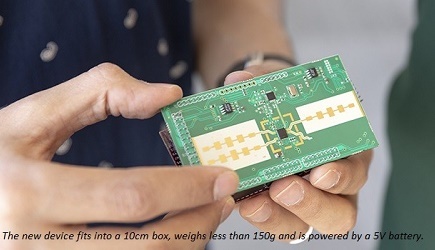 The NINA-B3 wireless MCU module also brings access to u-blox’s Connectivity Software, the most advanced in the market in terms of flexibility, features and easiness of use. NINA-B3 provides full Bluetooth 5 support for 2x data throughput, 4x range and 8x broadcast data, and reaches ranges of up to 1500 meters in line of sight applications. And this tiny, low power module does all this in one of the smallest footprints on the market. By combining, in open CPU architecture, a powerful core and versatile I/O with Bluetooth low energy long-range connectivity, high data transfer rates, Bluetooth mesh and 802.15.4, NINA-B3 is ideal for use in smart buildings, healthcare, smart cities, Industry 4.0, automotive and transportation. Additional applications include smart lighting systems, street lighting, industrial sensor networks, asset tracking solutions, building automation systems and more. NINA-B3 is built around the powerful nRF52840 chip from Nordic Semiconductor with an Arm Cortex-M4, 1 MB flash memory and 256 kB RAM. NINA-B3 still provides a pin and form factor compatibility with the wider family of u-blox NINA modules for Bluetooth, Wi-Fi and NFC, providing a fast upgrade path and flexibility for customers designing devices for several radio solutions. For more information, click here.